While walking on the beach I came across a squid egg capsule, washed up on the sand. They are 4-5 inches in length, translucent white, tapered at both ends, and generally contain tens of squid larvae each. They should be planted in the sea bed, beyond the breakwater, but sometimes they break off and get washed up on shore. Unfortunately, most of the squid larvae had died, due to being left out of the water, but I placed the capsule in a cup of sea water and within a few hours a few surviving individuals had emerged. I was able to photograph them at this interesting, early stage where their chromatophores are relatively large compared to their body size (5mm). The squid at the top of the picture expanded its chromatophores between shots. 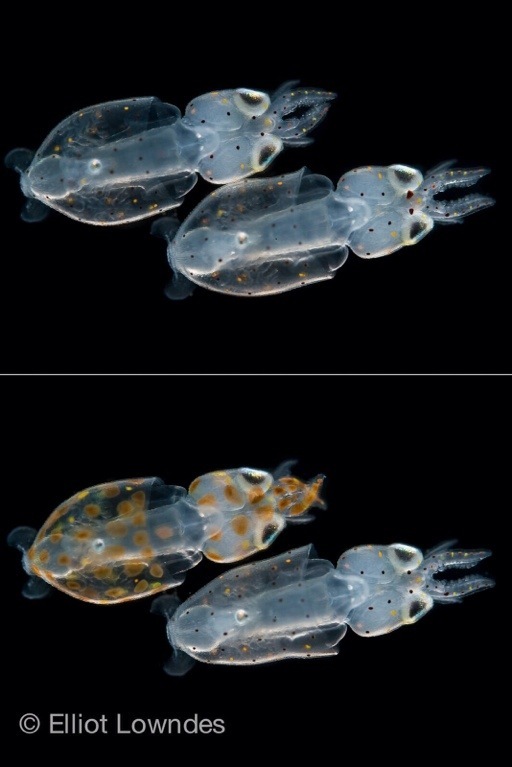 As the squid mature, they loose their transparency and are able to change the color of their entire body, or just sections of it at a time if they please.